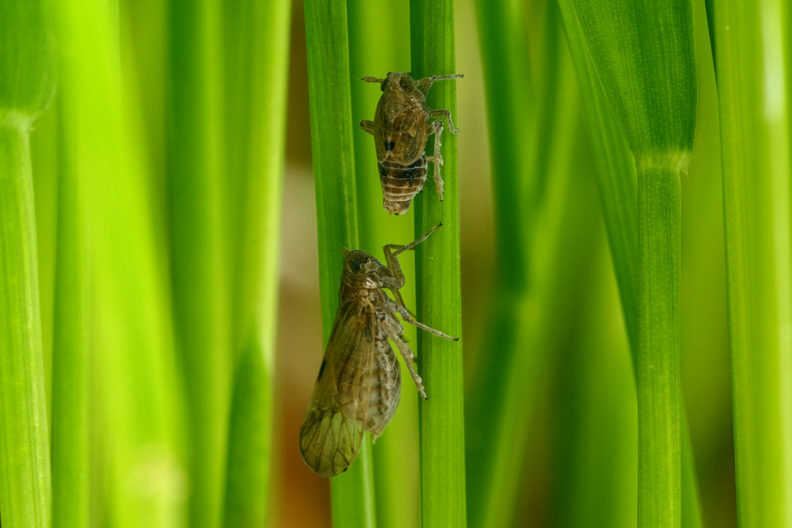 Two brown planthopper insects on a rice plant. The bottom one is the long-winged version that will migrate on to a new rice plant. The top is a short-winged version that won’t leave. Photo courtesy of Xinda Lin, Jiliang University. Wing size determines whether the insect can fly long distances to other plants or stick around and feed off nearby rice plants, said Laura Lavine, professor in WSU’s Department of Entomology. Over the life of a rice plant, the ratio of sugars to amino acids changes. During the early growth stage, rice plants are a great food source for insects. These young rice plants have relatively low glucose levels, and brown planthoppers don’t need to search out a new home. They develop with short wings and, in females, large ovaries. The young plant is healthy and provides plenty of nutrition for the insects to survive and reproduce. Once insects reach adulthood, they can’t alter their body structure, she said. “The results of this study will hopefully allow scientists a new way to figure out how to trick the brown planthopper into developing into the wrong form so that they die before they become pests,” Lavine said.